Wandering through the tiny beach town of Cayucos in the middle of the afternoon, I stumbled across an Old West-style saloon with a hitching post and a cigar store Indian outside. I poked my head inside, blinking a few times to get my eyes to adjust to the darkness. 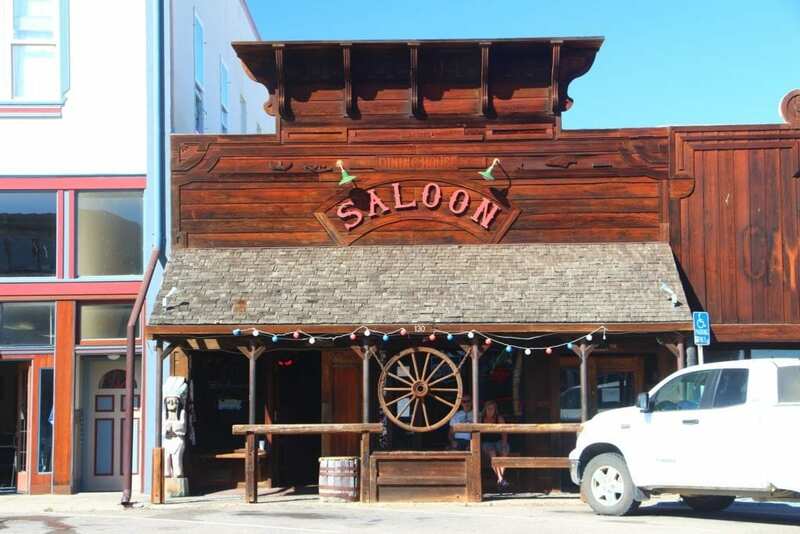 An antique, hand-carved wooden bar lined the right side of the saloon and inexplicably, dozens of dollar bills were tacked to the ceiling. “Come on in,” hollered one of two retired guys sitting near the door. Dressed in polo shirts and slacks, they were far from the scruffy seafarers this place served a 100 years ago. They looked as if they were enjoying multiple rounds of drinks after a round of golf. The men saw me staring up at the bills tacked to the ceiling. “Do you have a $10 bill? Or better yet, a $100 bill?” one of them asked me with a straight face. Still laughing, I shook my head and headed out the door into the bright sunshine. A seagull squawked. A car drove past with a surfboard strapped to the rack. And then all was quiet in this Old-West-meets-laid-back-surf town. 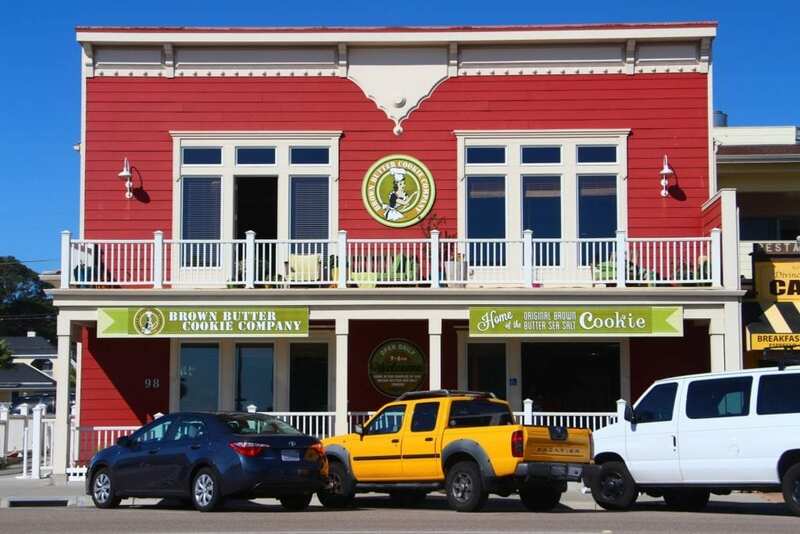 Cayucos’ main drag is lined with restaurants, surf shops, antique shops, wine tasting rooms, and an addictive cookie shop where the staff lures tourists with free samples. I walked up half a block to the Brown Butter Cookie Company, where I bought my second bag of brown butter sea salt cookies for the day and then headed back to the beach and the newly-restored wooden pier. The historic pier was built in 1872 by the town’s founder, Captain James Cass, and had long been a focal point for the community. 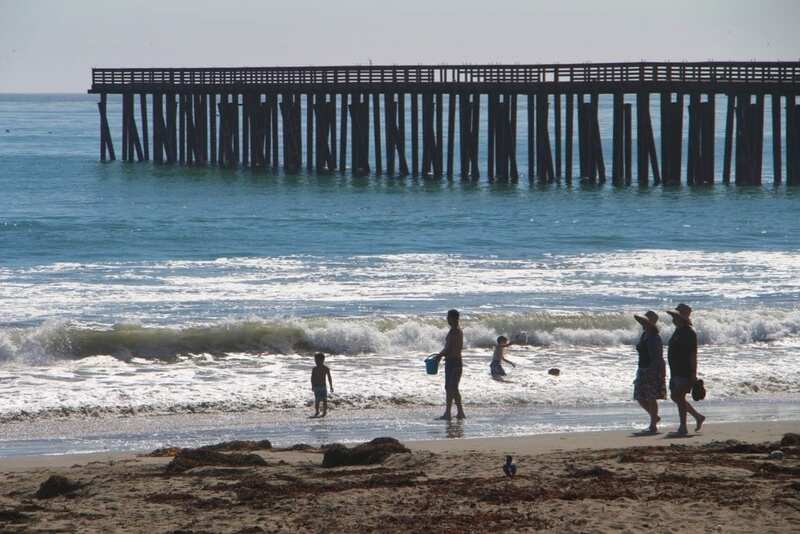 But over the years, rough surf and storms had compromised the pier’s structural integrity and safety. Local officials were forced to close it in July 2013. Residents worried they might lose the town’s iconic pier altogether, so they launched a massive fundraising campaign to save it. They raised $800,000 for the pier’s reconstruction and future maintenance. 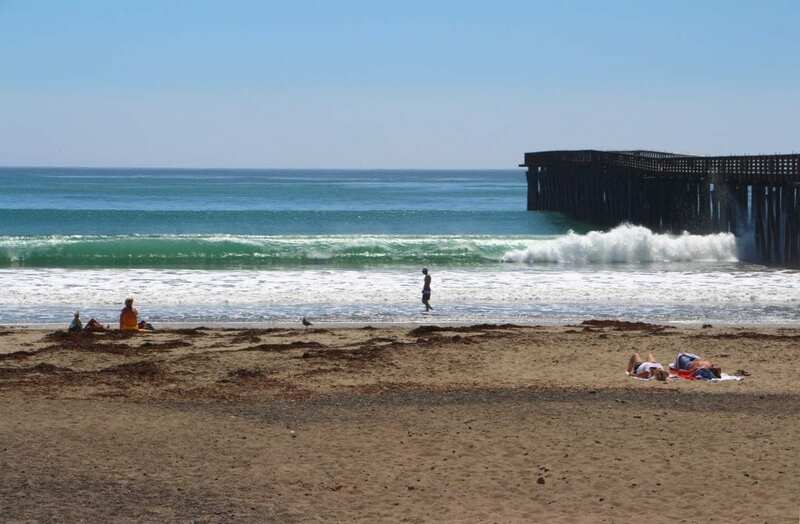 And after two fretful years of waiting and watching, Cayucos celebrated the reopening of its newly-restored pier in October 2015. The new pier, with its wider deck and graceful new lighting, is ideal for romantic strolls, fishing, and whale-watching. I walked out to the end of the pier with my cookies. Morro Rock lies five miles to the south and is accessible to beach runners and walkers at low tide. To the north, the Estero Bluffs line the craggy coastline and offers a great hike along the top of the bluffs. Off to the left, I caught sight of a whale breaching on the horizon. The whale’s splashing drew a small crowd of onlookers as she surfaced again and again. Eventually, the whale disappeared and so did my cookies. 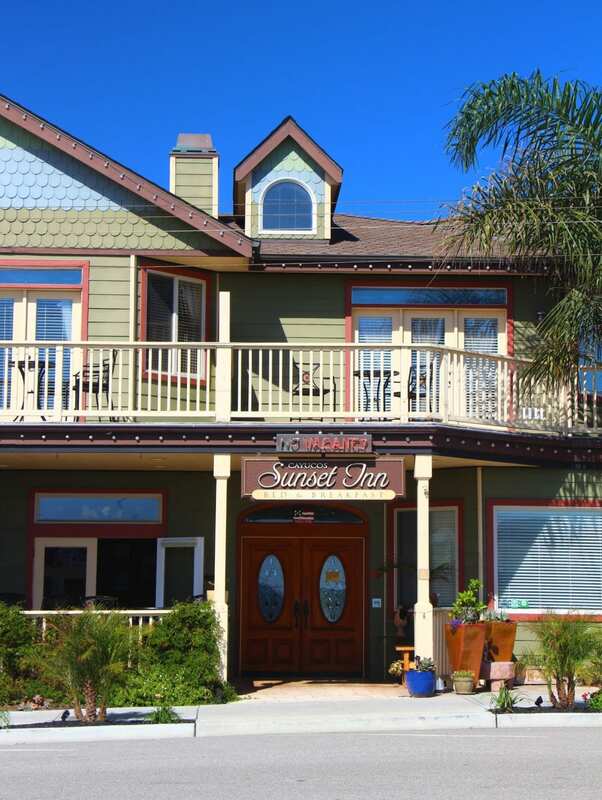 There are two lovely bed and breakfast inns in Cayucos: On the Beach Bed & Breakfast and Cayucos Sunset Inn, both of which are within an easy stroll of all the town’s attractions. 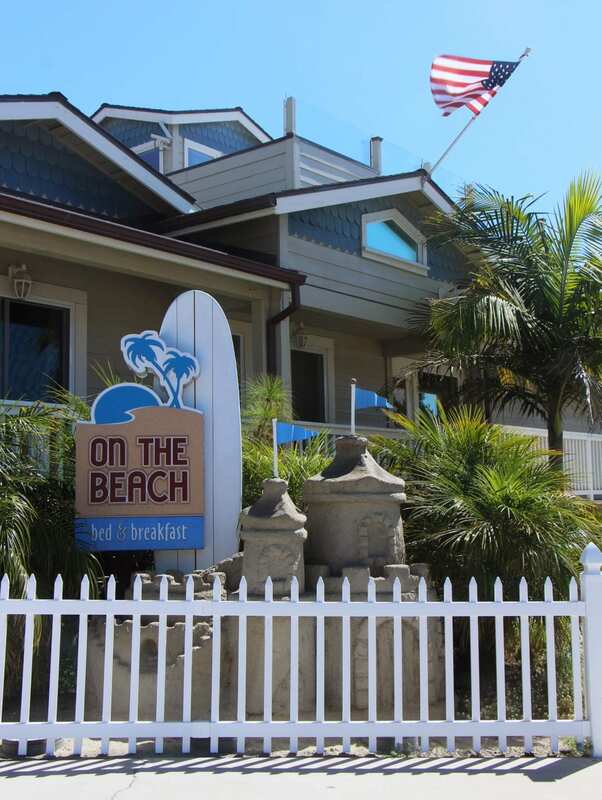 On the Beach Bed & Breakfast offers a stunning location overlooking the pier and Cayucos State Beach. 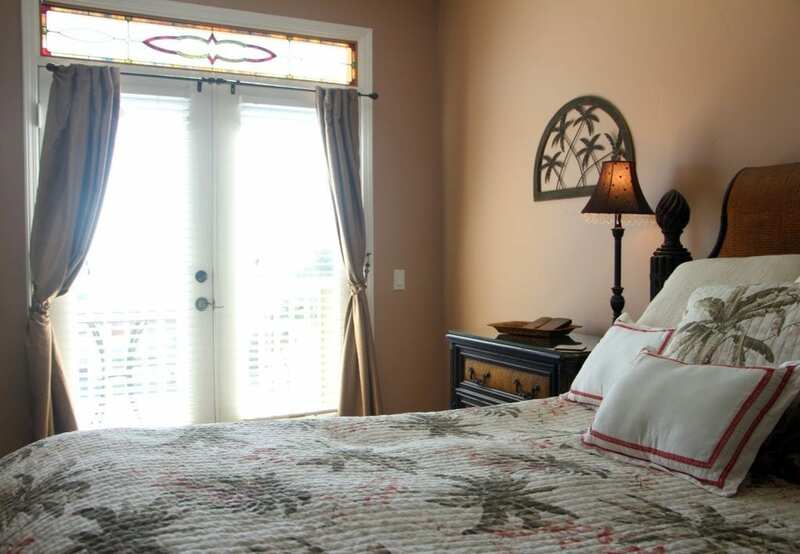 Eight of the inn’s 14 spacious guest rooms feature ocean views with balconies. The décor has a elegant coastal vibe and all of the rooms offer gas fireplaces, Jacuzzi tubs, luxurious sheets, towels, and robes, and eco-friendly bath amenities. The rooms are also equipped with microwaves, coffeemakers, small refrigerators, HDTV, and WiFi. 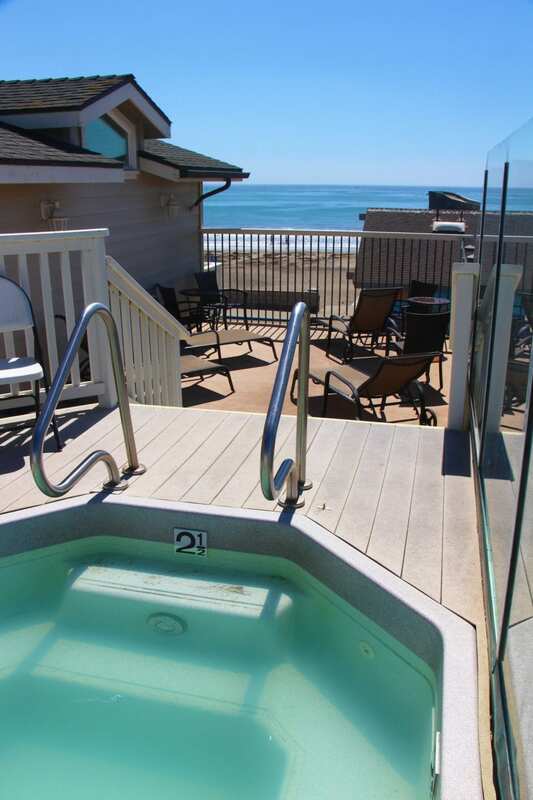 The inn’s rooftop sundeck with a hot tub and lounge seating provides a relaxing spot to watch the waves. Aside from the great views, On the Beach Bed & Breakfast is best known for its gourmet offerings featuring fresh, seasonal produce from local CSAs. Breakfast varies daily, but favorites include bacon leek quiche, blueberry pancakes, fried eggs on ciabatta with pesto, and challah French toast. The entrees are served with fresh fruit and pastries. From 5 to 6 p.m. each evening, the inn pairs appetizers with local wines for its social hour, highlighting a different winery each month. The inn also provides complimentary passes for a number of local tasting rooms including Dubost Winery, Adelaida Cellars, Cayucos Cellars, and Harmony Cellars. Also, don’t miss the inn’s homemade desserts, served at 8 p.m. each night. The Grand Marnier chocolate ganache tart is divine. The quiet and enchanting Cayucos Sunset Inn is just a few blocks up the street, a bit removed from the relative beach congestion. 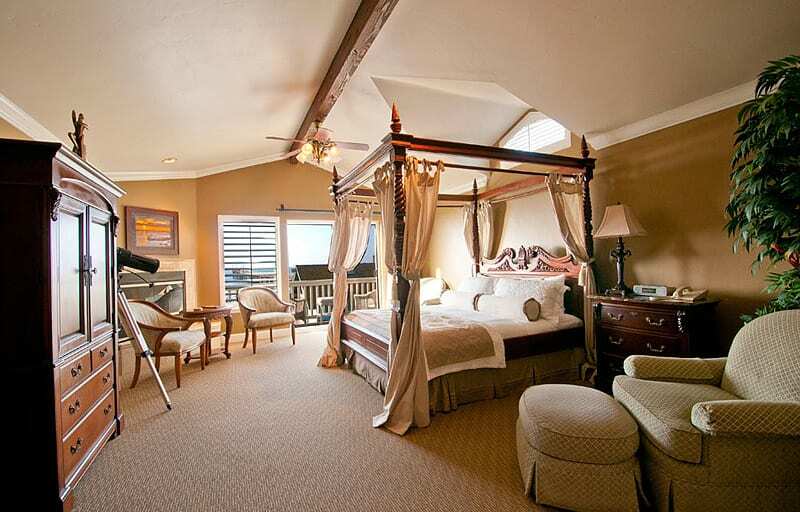 Long-time Cayucos residents John and Lisa Mankins designed and built the inn in 2002. Combining John’s background in construction and plumbing with Lisa’s expertise for textiles and interior design, the couple drew inspiration for the inn based upon their own travels through Europe, where they favored more intimate, bed and breakfast stays. The inn’s six guest rooms feature two-person Jacuzzi tubs, separate shower stalls with rain shower heads, luxurious robes and 600-thread count Egyptian cotton sheets, bar sinks with filtered drinking water, small refrigerators, armoires with televisions and DVD/CD players, stained glass windows, custom-built furniture, and French doors that open to private balconies. Most of the rooms offer ocean views; a few also have gas fireplaces. 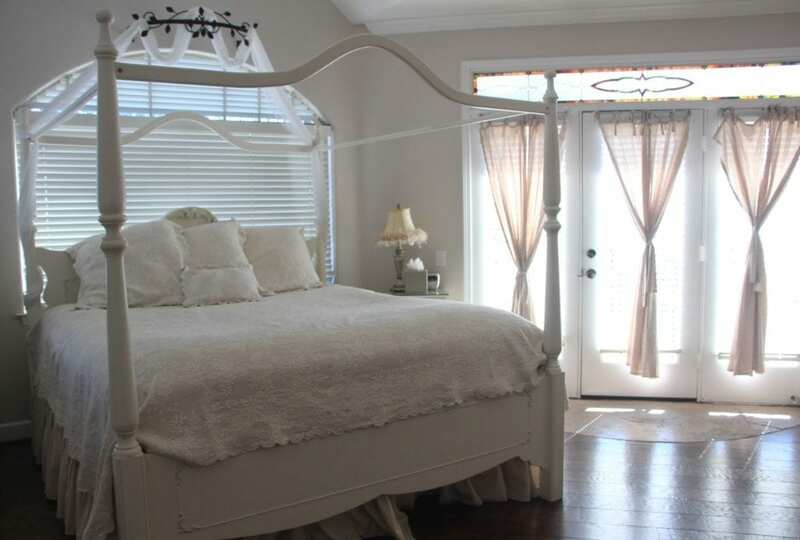 The rich décor varies for each room. The Palais room combines classic, black-and-white Parisian prints with black furnishings and red accents, while the Bali room presents a palm-tree motif in quiet hues of khaki and olive green with rattan furnishings and muted red accents. The spacious Sunset Suite is a light and airy mixture of pale-hued textures. 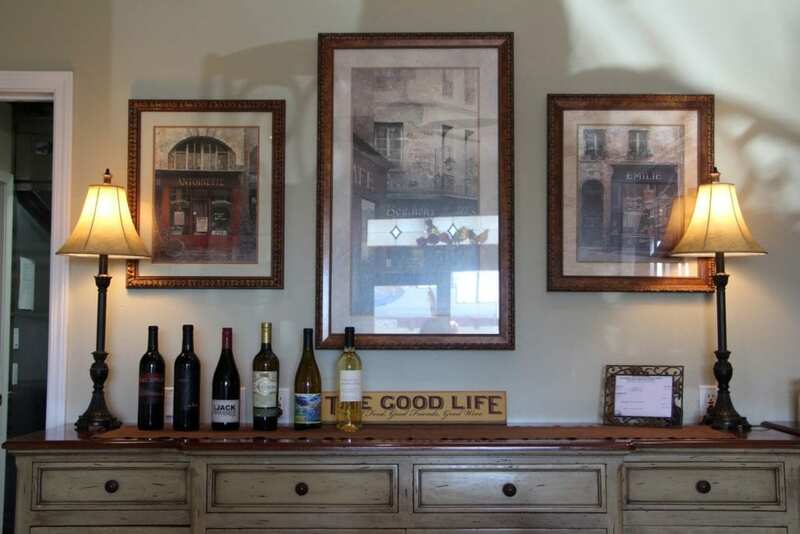 The innkeepers serve wine, cheese, and appetizers from 5 to 6 p.m. each evening. Freshly baked cookies and milk are delivered to the guests’ rooms at 8 p.m. In the morning, breakfast features a choice of a sweet or savory entrée and an assortment of muffins and scones.